Ravi Chaudhary, D.L.S. (M.S. ’99), at the National Air and Space Museum in Washington, D.C. In Washington, D.C., within the walls of the Federal Aviation Administration headquarters, Ravi Chaudhary, D.L.S. (M.S. ’99), is tasked with a job as big as the sky. 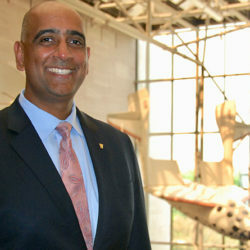 As director of Advanced Programs and Innovation in the Office of Commercial Space Transportation at the FAA, Chaudhary is responsible for looking into the future of commercial space transportation and all that comes with it: conducting analysis, research and pushing forward creative concepts to enable the success of his industry — meanwhile ensuring the safety of the public and foreign policy interests of the United States. And for Chaudhary, a man with a direct line to the president, not a day goes by during which the lessons he learned as an Industrial Engineering graduate student at St. Mary’s aren’t on his mind. Growing up in the suburbs of Minneapolis as the son of immigrants, Chaudhary doesn’t remember a time he didn’t want to fly. Upon graduating from the Air Force Academy, one of his first assignments as an officer was to help launch Delta II rockets into space carrying the first GPS satellites. When he landed in San Antonio, at what was then Kelly Air Force Base, Chaudhary grew intrigued by the skill sets of some of his colleagues. He looked to further his education and heard about St. Mary’s. “Looking back, going to St. Mary’s was one of the best decisions I could’ve made,” he said. In a simulation at the Johnson Space Center’s Neutral Buoyancy Laboratory, Chaudhary trains an astronaut on repair techniques from asteroid damage. As a young office in the Air Force, Chaudhary was selected for a NASA scholarship to research on-orbit space damage and repair for the International Space Station. While at St. Mary’s, Chaudhary was selected for a NASA scholarship to research on-orbit space damage and repair for the International Space Station — think the movie Gravity. Chaudhary’s master thesis project involved developing materials that could withstand the extreme rigors of space to serve as patches in case of asteroid damage. 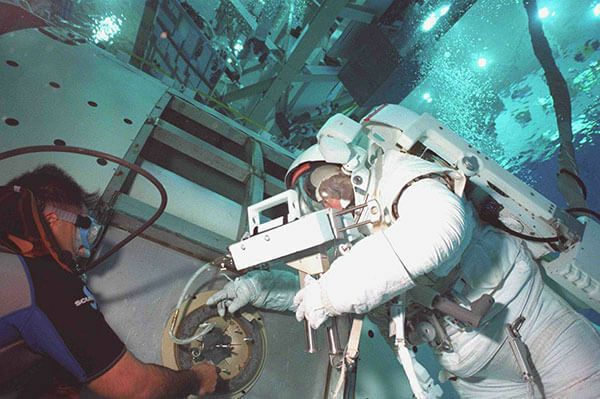 At Johnson Space Center’s Neutral Buoyancy Laboratory, he trained astronauts on repair techniques. Chaudhary joined the Air Force in the wake of the Space Shuttle Challenger disaster, and after graduating from St. Mary’s in 1999, the country he was serving was soon swept into war. “In the days after 9/11, the lessons from St. Mary’s, both analytical and leadership-wise, served me well while optimizing combat mission efficiency, and even coordinating critical rescue operations in Iraq,” Chaudhary said. Chaudhary’s military career lasted 21 years, with 760 of his more than 3,000 flight hours logged in combat. As a C-17 pilot, he conducted flight operations across the globe. While serving at the Pentagon in 2011, Chaudhary, a practicing Hindu, was offered the chance to lead the establishment of new chaplaincy programs to support Asian-American faith traditions. After launching the programs, the White House called him to serve as a member of the President’s Advisory Commission on Asian Americans and Pacific Islanders (AAPI). Chaudhary personally advised President Barack Obama on executive branch efforts to improve economic and community development, public and private sector collaboration, health, education and veteran support for the AAPI community. Upon retiring from the military in 2015, Chaudhary was hired by the FAA as executive director for Regions and Center Operations, overseeing a $254 million budget. Now, in addition to safeguarding launch and re-entry of commercial flight activities, Chaudhary also manages the issuance of licenses to commercial space transportation companies like SpaceX, Blue Origin and Virgin Galactic.